Dream Big. Take Chances. Have Faith. Welcome! I am incredibly blessed to live my dream and train as a professional distance runner. I love this sport because it is not just about winning or losing, it is about the journey. My journey so far has been incredible and I am thankful for how God has provided so many opportunities and supportive fans like you. Thank you for supporting my lifelong goals and dreams! Your support will make a difference as I pursue my dream to represent the USA, & as I seek to make a difference in my community. Born in LaGrange, Ohio, Amanda discovered track in 7th grade. Winslow considered herself unathletic growing up, but through hard work and dedication, she flourished into a top NCAA athlete with Florida State University, where she earned a degree in Sports Management. Amanda's goal is to represent the USA in the 1500 or 5000 meters in the Olympic and World Championship Games. She has a strong faith and looks to inspire others through her running. 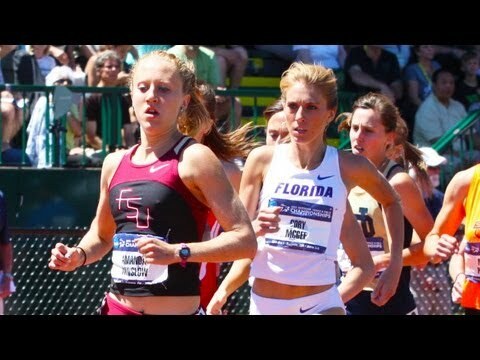 While at FSU, Amanda ran the 10th fastest mile in the history of the NCAA, with a time of 4:31.08. She was a seven-time All American in cross country and track and a ten-time All Academic Team Honoree with the ACC and USTFCCCA. In her first season running professionally, Amanda lowered her mile PR to 4:26, ranking her top 3 in the world for the event, and placed 4th in 1500m at the 2014 USA Indoor Championships, which was within a second of making the World Championships team. Off the track, Amanda has a passion for graphic design, painting, and photograph. Additionally, she enjoys reading, writing, and spending time with Goober, her pet gecko. Amanda, and her husband Chris, currently reside in Colorado Springs and both enjoy the scenic mountain trails and altitude training.